We are proud to announce today that our music and entertainment platform, uMusik.io has gone pro. 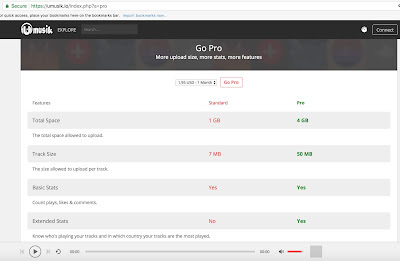 With less than $2, a pro version allows music lovers to upload now 4GB of total space allowed to upload music. The track size can be extended from 7MB in the standard package to 50MB in pro package option. With pro version, there are an extended stats about the music played, artists who shared the same taste in music and much more. With uMusik.io users can know who's playing your tracks and in which country your records are the most played. A pro version of the badge is given to those who have purchased a pro-version of the music through uMusik.io. Today we are proud to announce that two of our growth platforms. In Userly, which is an analytics platform we have fixed an issue with plagiarism check, set the URL shortener issue which was reported by some users and also improved other bugs. In e-Sathi, which is the social networking platform we have fixed number of issues. Thanks for all the users and our customers who provided significant help in improving our platform products. Today we are pleased to announce that Unelma Platforms UnelmaCloud platform has crossed over fifty customers. Hurray! In UnelmaClould users can store files and folders very easily. It is unlike the Google Cloud, DropBox and any other cloud storage services concerning the handling of those sensitive files and folders. As the goal of Unelma Platforms is to empower people, UnelmaCloud is freely available service. There are no hidden cost or credit card charges for the files and folder one manages on UnelmaCloud. We have reached a half-century milestone. Hip-hip, Hurray! What is the GDPR and what is our path to GDPR compliance? As promised we are showing you our latest stats on UnelmaMovie.com platform. In this early Q2, we have seen tremendous growth in UnelmaMovie.com platform. Our AI-based platform, UnelmaMovie has double the number of page views from 100k to 200k, over 100k movie titles and more than 75k actors automatically. Even the famous media houses in Finland and Hollywood are starting to contact us which is a good sign as we want to work closely with them. Let us know about your feedback and suggestions. 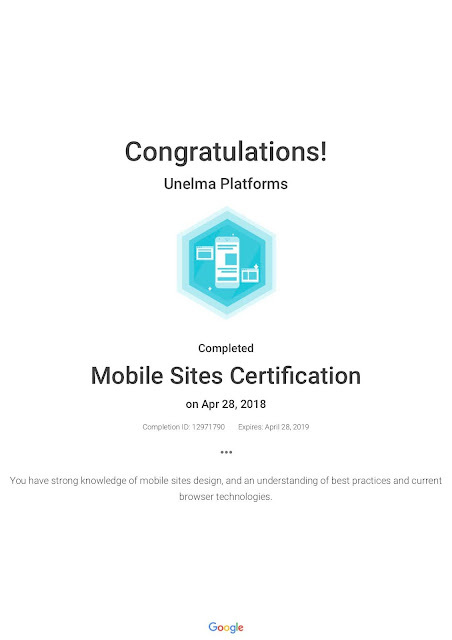 #Unelmaplatforms passed the Mobile Sites assessment to become certified in Mobile Sites. The Mobile Sites certification assessment is designed to test your knowledge of mobile website development.